As of late, I haven't been able to stop the deluge of fanciful thoughts in my head. I keep thinking of random favorite things! I'm currently loving harps and violins. The sounds are hauntingly beautiful! And there's this anticipation of the energy that comes with Fall that's keeping me awake at night! The surge of this crisp-aired energy hasn't hit yet, but knowing that its right around the corner has me bursting with excitement! Pumpkins! Coffee! Cinnamon candles! Disneyland fudge! Scarves! Firewood on mountain trips! 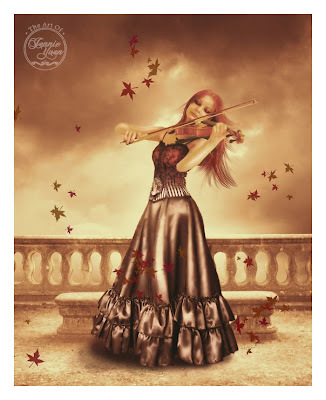 I used to play the violin and loved all orchestra music. Have you listened to Vanessa Mae? She is amazing! Violin has an exquisit sound. It could be uplifiting and lively as well as dark and hunting. It's awesome!